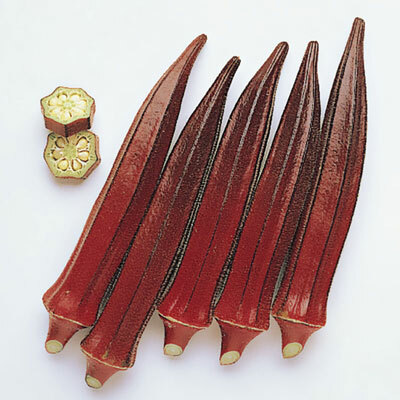 Burgundy Okra | Henry Field's Seed & Nursery Co.
Pods stay tender up to 8" long. Very attractive maroon-red pods that stay tender to 8" long. Pods turn green when cooked. Very showy with large, light yellow, hibiscus-like flowers veined in red. All-America Selections winner in 1988; developed at Clemson University. 55 DAYS. Germination 10 - 14 days. Soil Requirements: Rich, well-drained sandy loamy soil. pH 6.0 - 6.8. Pruning: For optimal texture and flavor, harvest often when the pods are young about 3" long. Fruit: Very attractive maroon-red pods that stay tender to 8" long. Pods turn green when cooked.